This week I've been working on the project for a trip down Memory Lane (Warracknabeal 10 November). I roughly sketch ideas and then let the fabric and stitching determine the direction a project goes in. And I thought I knew where I was heading until I found this stripe at Avonleigh on Monday. The colours are perfect and I have a thing for stripes. Today, I had a punch needle class. Of course I couldn't just leave the shop without buying a piece of fabric. So the chocolate piece had to come home with me. 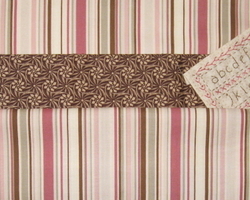 This is an old fabric but I love the print and have a piece in the rasberry. The borders are on my new quilt and I'm very happy. The background fabric (Roman Holiday range) is a lovely quality fabric. The few quilts I've made with the blocks set on point have ended up with sides and centres all measuring different lengths. So imagine my surprise and delight when this quilt was only out 1/4 inch. It has to be the fabric! When I started this quilt all I could picture was the fabric and shoofly blocks set on point. The rest of the detail was either very fuzzy or didn't exist at all. Late Saturday night when I finished sewing the blocks together it became obvious the quilt would need borders. Fortunately I still had 50 cm of the red. 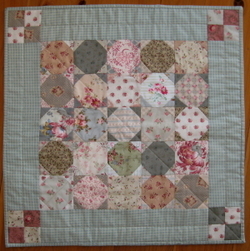 A trip to Patchwork on Stonleigh and the purchase of more background fabric means I can add two borders. 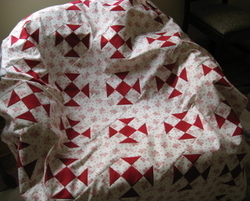 I still need to decide how to have it quilted and which fabric to use for the binding. 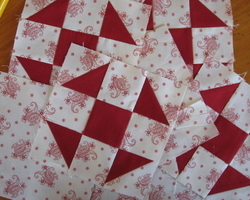 It would be beautiful hand quilted, but wait, which Christmas do I need it finished for? Last week I decided to finish off a couple of little quilts started ages ago. Here's another one completed (only 18 inches). What a satisfying feeling. Now I can start something new and not feel quite so guilty about all those unfinished projects. I'm not even going to think about the cushions started 20 + years ago! Last Friday, Jan, Sue-Anne and I visited Patches of Heaven at Temora, located in the South West (Riverina) area of NSW. It's a lovely shop, well worth the 2 1/2 hour drive from Albury, and Helen made us feel most welcome. Check out the store for yourself with a visit or online by clicking Patches of Heaven listed under Blogs and Links. I saw this block in an antique quilt. This got me to thinking about a new quilt for Christmas. The Roman Holiday range had just arrived in store and being red and white.......that's when I realised the block and fabric would make the perfect quilt for a Christmas display I have in mind. 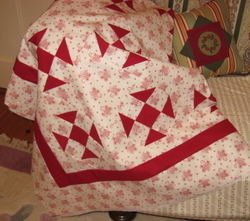 Recently, I've seen two quilts with the backs pieced. Both looked wonderful and I was inspired to piece the back for a quilt top finished months ago. The most satisfying thing is that I used up all the pieces left over from the quilt top and quite a few other pieces that were never going to find there way into projects. Now I can purchase some new fabric guilt free!